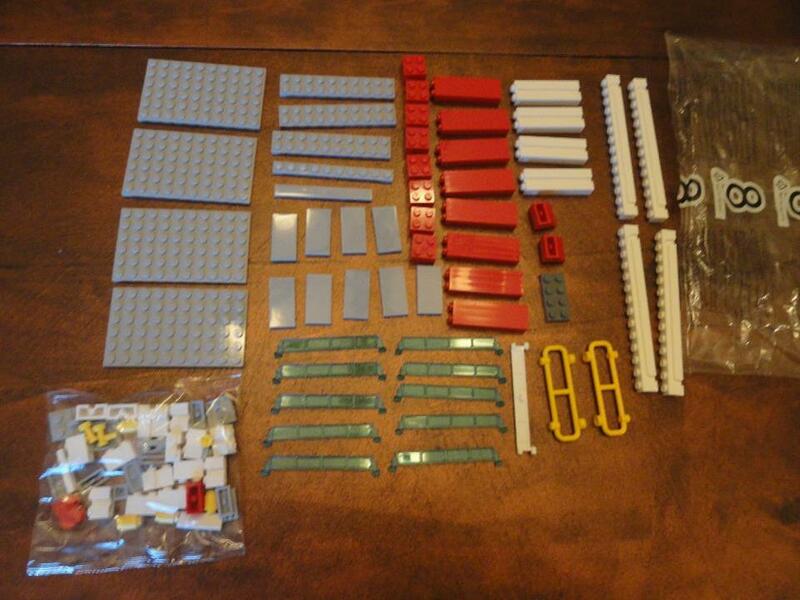 I got hold of a lot of loose LEGO; included were three closed packages without assembly instructions. Two of these were numbered as 7 and 8 respectively, the third one is without numbering. 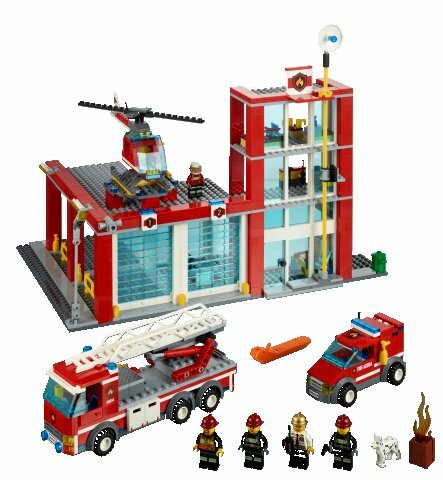 Given the size of the set (indicated by the fact that there are at least 8 bags), the occurrence of the Item 2584c003 - winch with reel and the Item 41539 - 8x8 light bluish gray plates in package "7", it looks like you have parts of set 60004 Fire Station in your hands, specifically one of the upper floors of the building, together with parts of the emergency pole. Package "8" is also part of set 60004 Fire Station, specifically parts of one the two main garages next to the office tower part of the Fire Station, the roof of the garage and some of the sidewalk. One of the key pieces here is the Dark Blue Part 3039 - Slope 45° 2 x 2, which is a fairly limited color. Of the 5 sets using more than 8 of that element (your picture contains 10), there are none that contain at least 2 more of the other elements pictured. As @PhilB commented, the 6x12 plate is also a rare piece. There are 0 sets that have both the Bright Green 6x12 plate and the Dark Blue slopes. The light bluish gray bricks are also not generally seen with those other two. 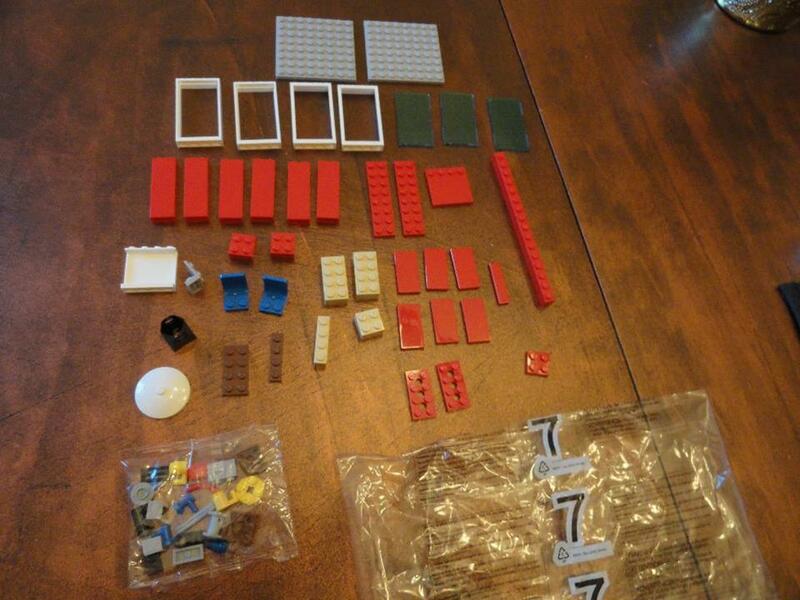 This is an assortment of bricks from a number of sets. The small bag may be able to be identified to the set it belongs in, but the picture of bag is not clear enough. Some elements are partially hidden by others or glare, and the color isn't clear enough. If a picture of the bag is taken more zoomed-in and on a white background (like a piece of paper), we may be able to ID it. I was able to find out this information by downloading a list of sets and pieces and turning it into a local relational database. I then queried that database to attempt to find sets which contained more than one of the different types of pieces pictured. 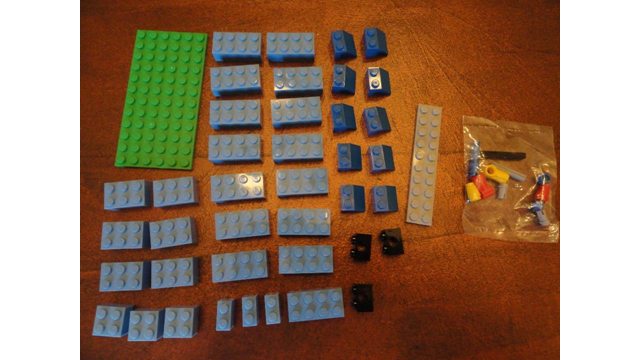 The other numbers, such as how many sets contain the piece/how rare a piece is can be done with a simple query, but many LEGO-related websites with parts listings have this information freely available.